Not So Popular's Tash Cordeaux catches up with new up-and-coming Irish street artist, Robyn Ward, after his opening exhibition of 'A Simpler Time'. 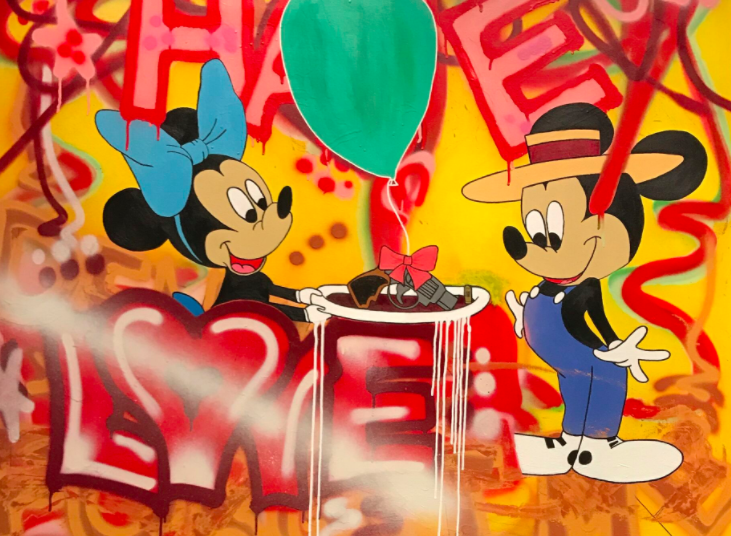 Using iconic cartoon characters Ward uses graffiti to toy with the simplicity of childhood in contrast with the realities of a post-Brexit society's economic, political and personal turmoil. How would you describe your style? What would you say are your main influences and the main issues that come through your work? C A T C H O F T H E D A Y - Robyn Ward, 2017. Robyn Ward: My style is contemporary street art. I spend a lot of time with my backdrops and creating an atmosphere of a wall. Things that influence my art most prominently are socio-economic and political issues: sexuality, drugs, money, amongst other current affairs. On the whole, these issues are what I aim to emphasise using my work. I use iconic 80’s and 90’s cartoon characters within my art, as they remind me of my youth and a simpler time, and help to parody of what I’m trying to convey. We are in a very strange economic and political climate at present. The more you scrape through the layers of what is happening in the world – money, drugs, sexuality, traditions and how we perceive the world - the more you realise there is a lot of mess behind it. What does the blurring of time periods mean to you? How are we to understand the mixture of the childhood favourite cartoons combined with the more ‘adult’ inferences of politics, sexuality, drugs and racism? Robyn Ward: Everything I paint is personal to me and what I see in the world. My experiences have changed the way I view things, which, in turn, has encouraged me to use art to return to a more innocent existence. All the things that looked perfect before are not – there is always something sinister underneath. I use cartoon characters from my youth as a source of parody; it’s showcasing life when I was younger and unaware of what was going on in the world around me. As a child, one can be very naïve to the world and the way it works. Whether this be global warming, bigotry, or something much closer to home as divorce. These characters are part of the irony of my work they remind me of a simpler time. This is intended so people can not only enjoy and feel familiar with the art but also think about what they are looking at. Even the most serious of issues can become enjoyable to look at when painted in this manner, enabling the creation of a piece that is visually inspiring as well as thought-provoking. V A G U E M E M O R I E S - Robyn Ward, 2017. ‘Modern Marriage’ and ‘Modern Love’ are interesting pieces. How do you understand ‘modern’ – is it sincere or ironic? Is there a comment being made on a potential shift in power balance between the sexes and in heterosexual relationships? Can you divulge what the Gun from Minnie implies, and the dollar bills in ‘Modern Love’. Robyn Ward: 'Modern Marriage' is a simple play on relationships/marriage today. It showcases a couple both with smiles on their faces, while Minnie is handing Micky a revolver with one bullet. This symbolises a lot of marriages that I saw in my friendship group while I was growing up. All smiles on the outside, but in reality, they couldn’t stand each other. M O D E R N M A R R I A G E - Robyn Ward, 2017. M O D E R N L O V E - Robyn Ward, 2017. 'Modern Love' – who has the power? This is something which I wonder on a daily basis. As previously mentioned, each of my pieces express what I see, but I leave the painting unanswered as this is for the viewer decided what to make of it. C L I M A T E C H A N G E - Robyn Ward, 2017. You clearly have views on global warming and (perhaps) a new form of KKK racism on the rise in our new political landscape. Can you share some of your views on these topics, and how it affects your art? Robyn Ward: Global warming is something which I feel very strongly about and so is racism. They are both prominent issues on the global agenda, even though they shouldn’t exist in this modern climate. ‘Climate Change’ and ‘Global Warming’ are both pieces that highlight both issues in one painting. It’s deeply concerning to me that a country with such power can have a leader who turns such a blind eye on global warming, and is a clearly an issue that we need to collate the strengths of our collective minds to address. The KKK symbolism was not related to the current political landscape, but is aimed more at the United States as a whole. There are clearly equality problems and it once again amazes me that a country which is so advanced in many respects can be so backwards in the basics. Finally, what do you think is the role of art, and in particular, graffiti art. Must it be political? Robyn Ward: Personally I feel there is no right or wrong when it comes to art. Art is a form of self-expression, and most importantly for me, the life experiences I only managed to grasp after the past 20 years. Art is an enabler which lets people showcase their creativity. This does not need to be political in the slightest, I merely paint about socio-economic and political situations that I have seen throughout my limited experience in the world so far. This is just how I want to express myself and something which I feel is important to me. My aim is merely to paint what I see from my experiences, create awareness but simultaneously allow the audience make up their own mind. Robyn Ward (03.10.82) is a contemporary Irish street artist who currently resides in London. A self-taught artist, he spends most of his time working out of Europe, Asia and North America. Ward gained early interest in the visual arts through graffiti when he lived in Belfast, Northern Ireland. Developing what would later become his own unique style, he started drawing on the streets of Belfast when he was 15 years old and has never looked back. Ward’s art is based around his views of the world. His most recent work is influenced by the current landscape, taking inspiration from politics to society’s obsession with beauty and youth. Robyn's next show will be in September 2017, where he promises to be unveiling all new pieces.